Click the question to see answers to our most asked questions. How can I search for products more effieciently? 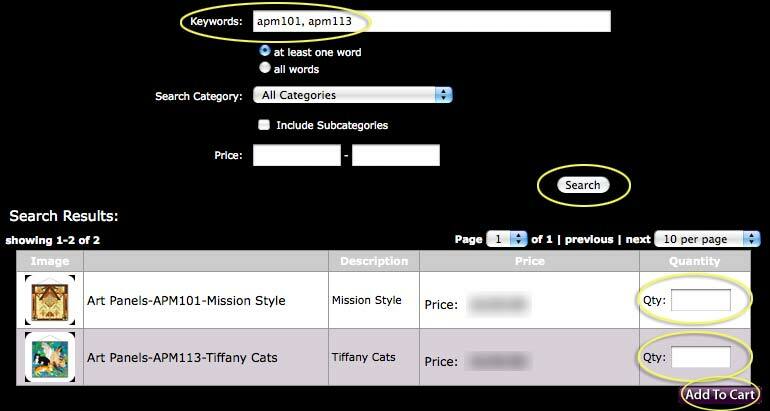 Lets say we want to search for several part numbers at once, you can just enter them in the search window. 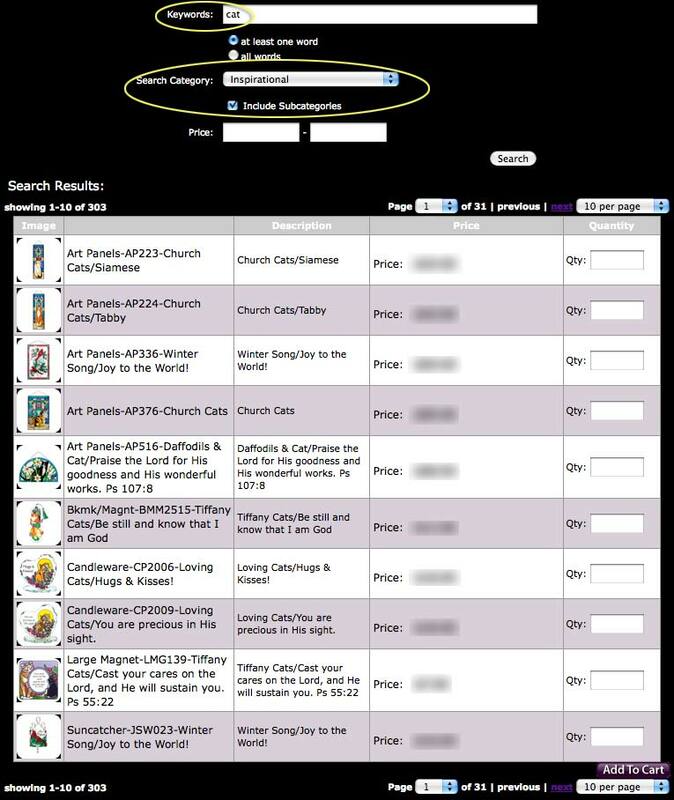 You will notice that you can further refine your search, or add more products, then click the "Search" button. To quickily add these products to your cart you can enter the quantities and click the "Add To Cart" button. No problem! Lets take a look at a different way to use the search. We will tell the site to find all of the cat products that are part of our Inspirational category. We will simply tell it to search for the word "cat" and then pull down the "Inspirational" tab and be sure to click the "Include Subcategories". Need more information about the products that the search found? Just click on the product photo! Are your products traditional stained glass? Although some of our pieces may look like they are made from stained glass, each piece is actually hand painted with a lacquer-based glass stain. The painting process allows much more detail in both line work and color than would ever be possible with cut glass. The wonderful part about our product is that our pieces are much more detailed and more price friendly than stained glass. Can I use my hand-painted glass tray like a regular functioning tray? Our glass trays are functioning decorative décor and are meant to be used like a regular tray; however you should use caution when putting heavy or hot items on the tray. How do I clean my glass product? We suggest using a damp cloth to gently wipe away any dust or dirt. Each piece should be treated as you would any other piece of art. Do not put in dishwasher or use any sort of cleaning product. Do your Wood-Framed Art Panels include hooks? Yes, our Wood-Framed Art Panels come with hooks ready for hanging. We also offer a range of decorative brackets and easels to stylishly display our larger art products. Can I hang my hand-painted Art Panel with a suction cup? Our suctions cups are intended to hang our small, medium and large Suncatchers, and cannot hold the weight of an art panel. We do offer wall brackets for hanging and displaying our larger art panels. I love the look of your art panels, but I'm not sure how I would hang it. We recommend screwing a “cup/celing hook” into the top of the window frame. To lower it to the correct viewing level, you can use a hanging chain which can be purchase inexpensively at a hardware store. Attach an S hook to the chain and you're all set! Are any of your hand-painted glass products heat treated? No, except for our tile trivets. All other glass products should be treated as a piece of art and you should avoid putting hot items on them. I'm nervous that the glass might break during shipping, How can you prevent that from happening? Breakage is rare. We have spent a lot of time working with Fed-ex and UPS developing shipping cartons that are designed for safe shipping. It is still glass so we try to label everything FRAGILE. Because of our shipping box and the labeling we have very few damages. Will my hand-painted glass product fade in the sun? Though we use the most fade resistant paint available, the colors will unfortunately fade if left in direct sunlight. We suggest you display your hand-painted glass product away from direct sunlight. Do you sell replacement batteries? We have found that it is often cheaper for our customers to buy a new light than to buy the individual replacement batteries. Yes, we can produce a custom design for you, a minimum of 300 pieces must be prepaid.